Many people decide to come forward, thinking they can claim some of Warbucks millions in the process, but they are all turned away as fakes. That is until one pair come along with a convincing story, and Warbucks must sadly say goodbye to his new daughter, thinking she has been reunited with her real parents. These new parents for Annie turn out to be Miss Hannigan’s criminal brother, Rooster (Tim Curry), and his girlfriend Lily. Luckily though, Annie’s orphan friends had over heard the pair plotting with Miss Hannigan at the orphanage, so they make an escape and go to tell Warbucks, who races to the rescue. 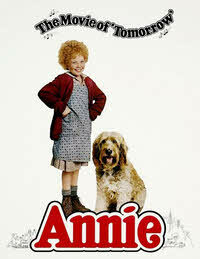 Annie is a fine family film featuring lots of memorable songs including “It’s a Hard Knock Life“, “You’re Never Fully Dressed Without a Smile” and “Tomorrow“. The cast all give great performances, especially the young orphan girls who sing and dance extremely well given their young ages. This entry is filed under Films - Kids	and was posted on January 24th, 2011. You can follow any responses to this entry through the RSS 2.0 feed. You can leave a response, or trackback from your own site. I’m sorry, I’m sorry but Annie always made me want to stick a sharp pencil in my eye. It really did this small redhead no favours. Oops, sounds like I might have dragged up a childhood memory there you would rather have forgotten. Sorry GingerDoll. We all have the odd flashback and alas Annie causes mine! I do realise many people love it.